Tuesday 29th September 2015, 6:30 pm. Venue: Room G.07, University of Edinburgh Informatics Forum, 10 Crichton Street, Edinburgh, EH8 9AB. One of the Second World War's most fascinating stories is that of the Enigma machine, a portable encryption device widely used by the Germans, whose ciphers they believed to be totally secure. Nevertheless, by mathematical analysis and modern technology, the Allies devised techniques for 'breaking' Enigma ciphers, and thus read several million German messages, providing a wealth of reliable Intelligence. The attack on Enigma, initiated by the Poles in the early 1930s, was later perfected by the British at Bletchley Park, today open to the public as a museum site. The Intelligence gained was of immense value to the Allies in virtually every theatre of war, but nowhere more so than in the Battle of the Atlantic, that fierce conflict which lasted nearly six years and cost over 60,000 lives. Dr Baldwin uses the Battle of the Atlantic to exemplify the importance of code breaking in winning the war. After the presentation, the audience are invited to take part in a hands-on practical demonstration of one of the few surviving Enigma machines. Only about 300 are known to survive worldwide; of these, only about a dozen are in public collections in Britain. As these machines are so rare, Dr Baldwin is providing a unusual opportunity for the audience not just to view, but also to operate, an original U-Boat Enigma machine – the actual machine which appears in the recent film, ‘The Imitation Game’. A Cambridge University engineering graduate, Mark Baldwin worked initially in civil engineering, before obtaining a Master's Degree in Soil Mechanics from Imperial College, London. After 15 years' lecturing at Imperial, he moved to Shropshire to develop his book-selling and publishing business, established part-time in 1978. One important speciality is WW2 Intelligence & Codebreaking, and he has published eight books on this subject. 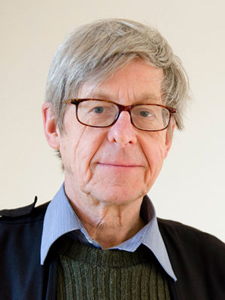 For nearly twenty years, Dr Baldwin has spoken widely in UK and abroad on various 'Secret War' topics (over 500 to date), focussing particularly on Enigma and Bletchley Park. He regularly speaks aboard cruise ships - and was commissoned to supply a U-Boat Enigma machine for the film 'The Imitation Game'.